It is unclear what discussions – if any – Chief Minister Michael Gunner had with Aboriginal interests before proposing the current civic centre as the new location of the proposed National Aboriginal Art Gallery. Harold Furber, who is heading up with Owen Cole a push for an National Aboriginal Culture Centre, says he has not been approached. Eli Melky, speaking as a private person and not as a Town Council member, says a group to which he is close has not mentioned to him that there have been discussions with the government about the changed site. The group was instrumental in the Town Council rejecting Mr Gunner’s first preferred location, the Anzac Oval precinct: 10 senior Arrernte custodians signed a letter to the council. Meanwhile Mr Furber, one of the signatories of that letter, has made it clear that the gallery and the centre – individually or combined – should be south of The Gap for compelling cultural reasons. “That’s what the people want,” he says. It seems clear that in Mr Gunner’s dealing with these Aboriginal projects, Aboriginal people remain pretty low in the consultation priorities. Mr Gunner says in his letter addressed to Mayor Damien Ryan “we have spoken extensively to Aboriginal people about the project – they are overwhelmingly supportive of it, however we acknowledge that a number of senior Aboriginal people have withdrawn their support for Government’s proposed site. 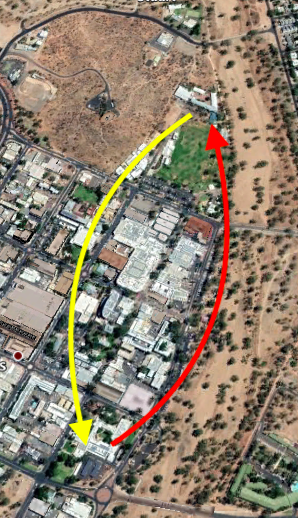 The proposal – leaked in mostly accurate detail last week – is to hand over to the council the government-owned site of the old Anzac Hill School, clear the land, fund and build a new Alice Springs Town Library; fund and build a water play park; support the development of a new council administrative centre; and retain Anzac Oval in its current form. “In exchange you will hand to the NT Government the site on which the current [council] administrative centre and town library stands to allow for the development,” Mr Gunner wrote. The council considered the offer in “confidential” session – excluding the public – last Monday. Cr Melky had unsuccessfully moved to have the issues dealt in open council. In today’s Executive Development Meeting he move successfully to lift the item out of “confidential”. He says the council will now proceed with “discussion and mapping out consultation”. The Alice Springs News Online has asked Mr Gunner for details about his consultation with Aboriginal people so far. Why not leave perfectly good buildings in place build an exciting new appropriate structure south of The Gap, in the style of a broad sweeping bridge over the Todd River. It’s an idea that past resident and creative thinker, Miranda Sage, shared with me. I’ve just visited a museum built across a river in Maccangna at Lago Maggiore in Italy which prompted me to comment. Waste of energy, time, money gone in this project. But when are we going to get an idea of what is going to go in this gallery? Where those beautiful paintings, artefacts, creations are stored waiting to see the light of day? The town council should never have accepted to discussions behind closed doors. We the residents and ratepayers have the right to know. Mr Gunner promised an open and transparent and trustworthy Government. So did our Council. Therefore: All government data should be made available upon request, in a timely manner. I still can’t get my head around why the “South of The Gap” is so important. There are many galleries in the CBD that have art from all over the joint. Aboriginal people is a more respectful term than aborigines. Please edit.